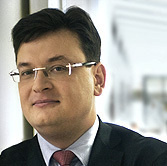 Ľubomír is the founder of the firm and its managing partner. He graduated from the Comenius University School of Law in Bratislava (Slovak Republic) in 1991 and obtained an LL.M. degree in common law from the Georgetown University Law Center in Washington, D.C. (USA) in 1996. He also studied international law and diplomacy at the Charles University School of Law in Prague (Czech Republic) and attended European Economic Communities Law Program at Rijksuniversitaet Groningen Law School in Groningen (The Netherlands). Prior to founding the firm, he worked as an associate with a local law firm in Bratislava and a legal counsel with the Bratislava Options Exchange, Czech & Slovak American Enterprise Fund (a venture capital fund funded by the U.S. Government) in Bratislava and Washington and Citibank (Slovakia). Ľubomír specializes in banking and finance, mergers and acquisitions, venture capital and private equity transactions and securities. He was involved in the privatization of one of the largest banks in the former Czechoslovakia and has represented foreign and local clients (both on the buy side and the sell side) in a number of private corporate transactions. He has also acted as an advisor on various finance projects and banking regulatory matters. He is fluent in Slovak, English and Czech and has a basic command of German and Russian. Ľubomír has been registered as an advocate in the register of advocates of the Slovak Bar Association since 1997.